Tag Archives: What Is That Thing? 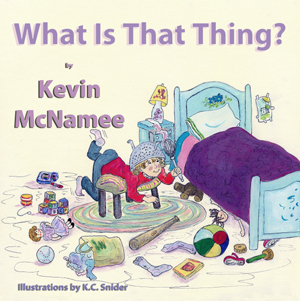 A sweet and funny story of becoming a big sister is what you’ll find in What Is That Thing? . Jenna’s not too sure about the newest family member, so she decides to use her imagination to help adjust to being a big sister. In this delightful new story from talented poet and writer, Kevin McNamee, we see him doing what he does best–create a story that youngsters will love. Becoming a big sister for the first time can be very scary, but Jenna makes it easier by using her imagination to ask “What is that thing?” Is it an alien from outer space? Is it a strange and smelly creature? Maybe it’s a mysterious roaring animal. The artwork by K.C. Snider is absolutely wonderful. From mom the space alien with kitchen utensils sticking out of her head to Jungle Jenna swinging on the vines, her illustrations will capture the hearts of young readers who really want to now how Jenna feels. What Is That Thing? would make a perfect gift for the little girl who is going to be a big sister soon. book reviewsbooks about becoming a big sisterbooks for young readersbooks that teach children a lessonChildren's picture bookschildren's books that teach a lessonchildren's ebookschildren’s authorsGuardian Angel PublishingKevin McNameeLittlest AngelsThe Children’s and Teens Book Connectionwelcoming new siblingsWhat Is That Thing?